The first kind of intelligence is conative. It refers to our desires, aspirations, values, and intentions. To a large extent, these aspirations determine the course of our lives. By developing conative intelligence we learn how to make wise decisions that truly benefit ourselves and others. The second kind of intelligence is attentional. How we direct our attention plays an enormous role in determining our sense of who we are and the world around us. The cultivation of attentional intelligence—the ability to focus our attention with calmness and clarity—leads to optimal performance in everything we do. Please bring your own meditation cushion if you intend to sit on the floor. Chairs are also provided! Bring your own refreshments. There are many shops nearby. He also brings deep insight into mindfulness as taught in secular movements and spiritual traditions other than Buddhism. Apart from his training in Buddhism, Dr Alan has a degree in physics and philosophy of science, and a doctorate in religious studies. 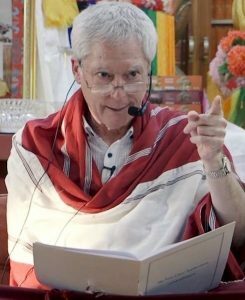 Drawing on this multi-faceted background, he brings many years of dedicated and profound practice to the challenge of integrating traditional Buddhist training with the needs of the modern world.